Fun Friday: Transit Map Pr0n And A Holiday Surprise from the SFMTA/Muni! I was all set to write a short post about an interesting article at The Design Observer about the different design concepts behind transit maps, and the relative merits of each, but then I noticed the (awesome) Burrito Justice blog already posted a similar post, which is cool. The overall discussion is an interesting one from a design perspective – do you make a map that follows the (often odd) geography of a region, as some do, or do you take the more geometric approach that the London Underground picked? Which one conveys the information best to the potential rider? The arguments for different approaches are interesting to me, as someone who has to deal with design issues daily. However, after reading Deisgn Observer’s post, I ended up finding a number of unusual maps people have created, all with some common themes, and they were rather entertaining. First, was this map of the US Interstate System, done in the style of the London Underground. What started as a post on Flickr ended up becoming a phenomenon online, and you can buy high quality prints of the artists’ work. 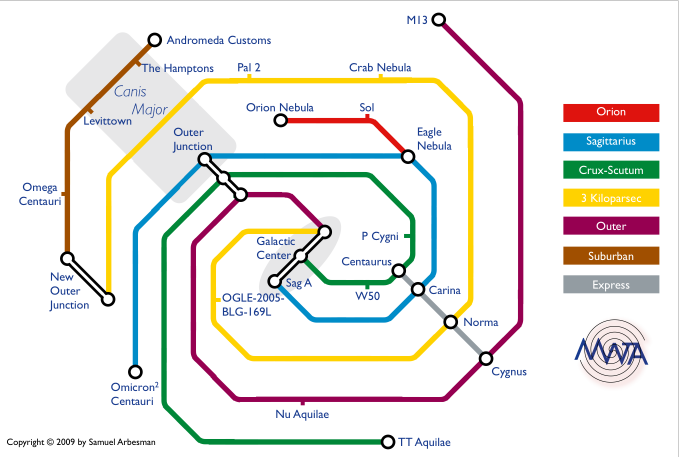 The other (pictured) is a map of….the Milky Way Galaxy (aka the Milky Way Transit Authority“). Reader Michael noted this on Tumblr.com and I found the original site online. I thought this was rather entertaining – you can get a PDF and related merchandise at the original site. Finally…over the holidays Reader Nina asked me what was going to become of all the old Muni maps at the many bus stops that were replaced and it if was possible to get one before they were all tossed in the recycler. A quick call to SFMTA spokesman Judson True, and I found out they were to be recycled, so I asked if I could have a few, since they were headed to the recycle bin anyways. Imagine my surprise when I got a very very small stash of high quality laminated maps of Muni (pre cuts) thanks to our pal Judson! They are rather cool, and were a nice find right around holiday time. Also, some thanks go out to Reader Nina, who gave me the idea to ask – I wouldn’t have thought to do so if she hadn’t suggested it. Since people seem to like to collect these sorts of things, I’m working on a contest to give away what few I have to Loyal Readers in the near future, so be on the lookout for that. Happy Friday! This entry was posted in Links of Interest, SF Photos. Bookmark the permalink.